Despite the profound importance of mental health to our well-being, many people put little thought into it or regard it as a non-reality. Mental health is an invisible life force, and many people do not see the value in focusing on something that they do not experience with their five senses. They do not think that their mental health really has that much effect on their lives. This is common of people who are in good mental health and never had much of a reason to analyze it, or they have just enough mental health to function and otherwise not question their thought and behavioral patterns. The fact of the matter is, everyone has room to improve their mental health. In fact, having a constant goal of improving on one’s mental health is a sign of pinnacle mental health. 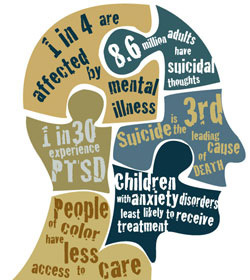 Everyone needs to be aware that their basic quality of life hinges on the state of their mental health. One badly needs good mental health for coping with hard times, for example. Hard times strike everyone in the form of unfortunate life circumstances or damaged relationships. Difficult life events are burdensome on everyone and have the potential to do permanent damage to a person. However, if a person has strong mental health, they will be able to overcome difficult life circumstances and rise above them. One could think of optimal mental health as the ability to receive all hardship as a learning opportunity and a chance to grow. Mentally healthy people do not become trapped by hardship, but rather implement the lessons learned through hardship to their lives and become stronger. Mental health is also an essential for maintaining balance and appreciating the good things in life. When life circumstances are neither good nor bad, simply neutral, an unhealthy mind will slip into negative thought patterns and interpret the circumstances as bad. Similarly, when life circumstances are positive, a mentally unhealthy person will still be unable to respond to them appropriately. If they experience joy, it will be manic or short lived, then will give way to negative thoughts and behaviors once again. It is essential that people with poor mental health strive to achieve good mental health for their own well-being as well as that of the people close to them. If you or someone you care about is struggling with mental health issues, seek professional treatment for a better quality of life. Mental health professionals can offer you anxiety and depression help, anger and stress management, plus a range of other treatment options. Do not suffer alone. Reach out for help today!